Despite Round 1 being full of upsets (8 seeds fell), the opening round of the tournament was headlined by the dominant performance of the tennis elite. Nadal, Dimitrov, Kyrgios, Djokovic and Federer could hardly have been more impressive, further entrenching their favouritism to go all the way. Presented below is a summary of the updated predictions after Round 2. 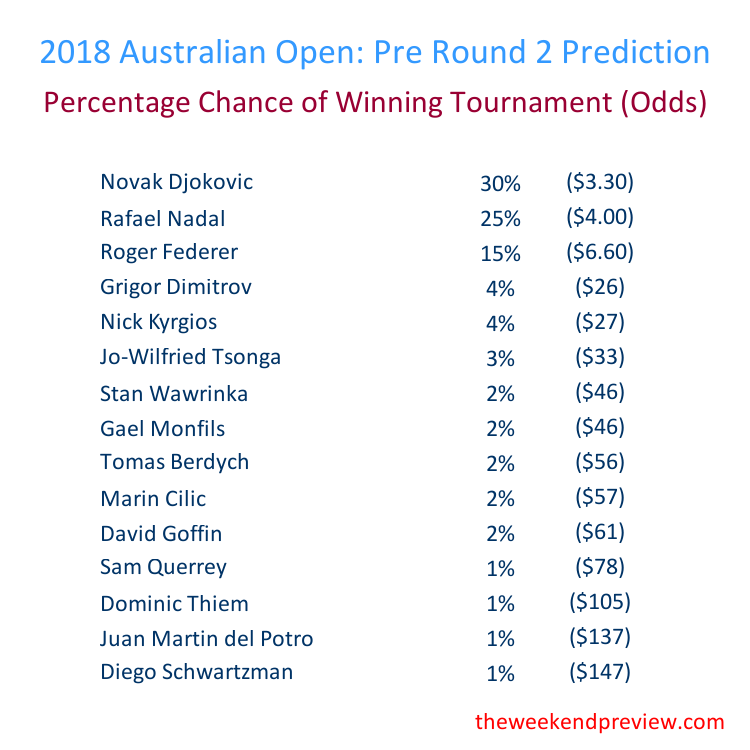 Rafael Nadal’s odds of winning this quarter have firmed after the elimination of John Isner in the first round. His likely quarter-final opponent remains Marin Cilic. Outside of those two players, it appears a fairly even spread of talent, including two Australians, John Millman and Matthew Ebden. Both impressed in their opening matches and they have challenging, but not unbeatable, second round opponents in Damir Dzumhur and Alexandr Dolgopolov. Quarter 2 remains the most intriguing quarter of the draw. In the top half, Dimitrov, Kyrgios and Tsonga are fighting it out for one quarter-final position. In the lower half all four seeds were eliminated and the quarter-finalist from this corner of the draw is almost a raffle. The anticipated Dimitrov-Kyrgios Round 4 match-up is looking particularly enticing. Djokovic and Wawrinka passed their first round fitness tests, but doubts still linger about both of them. In particular, Djokovic’s re-modelled serve could be a concern against a tougher opponent. His Round 2 match-up against Gael Monfils may just be that test. Djokovic has a dominant head-head record against Monfils, so the match will act as a barometer for how realistic our expectations should be for Djokovic. Thiem, Zverev and Verdasco were others in this quarter of the draw to impress. Verdasco has always had the ability, so the first round upset of Bautista Agut didn't shock. The question is, does he have the consistency to make a deep run into the tournament? Federer has strolled into the second round and with the elimination of Raonic in the first round, his path to the quarter-finals has softened. In that quarter-final he is likely to meet one of Goffin, Berdych or del Potro. After the opening round of matches the Big-3 have firmed in favourtism, each predicted to come out of their quarter of the draw. Behind them is Dimitrov, Kyrgios and Tsonga, representing the most likely challenger from the second quarter of the draw.